Minnesota’s Supreme Court has dismissed former Sen. Norm Coleman’s challenge to the state’s November election results and declared Democratic challenger Al Franken the winner. 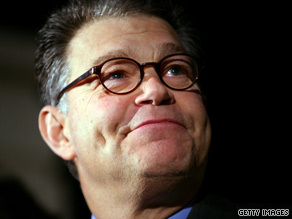 The court’s unanimous, unsigned opinion declared that Franken “received the highest number of votes legally cast” and is entitled “to receive the certificate of election as United States senator from the state of Minnesota.” If the ruling brings an end to seven months of challenges by Coleman, Franken would become the 60th member of the Senate Democratic caucus, a move that gives the party a filibuster-proof majority in the chamber, at least on paper. The former “Saturday Night Live” writer and performer had declared victory in the disputed race after a recount ended in January, but Coleman, a Republican who had been seeking a second six-year term, went to court to challenge those results. Coleman led Franken on election night by a margin of 206 votes out of more than 2.9 million cast. The margin was narrow enough to trigger a recount, however, and that process ended in January with Franken leading by 225 votes. Coleman still could attempt to take the challenge to federal courts. But Minnesota Gov. Tim Pawlenty, a Republican, told CNN on Sunday that he would sign Franken’s election certificate if the state Supreme Court declared him the winner.